Not long ago, a friend and I were reminiscing about maintenance issues we had encountered when we were working as truck techs. He brought up how during regular maintenance some of the mechanics would miss lubricating the clutch cross-shaft and throw-out bearing. On these particular vehicles this maintenance step required the removal of a cover to access the grease fittings, so it was easy to miss lubricating these lube points. Unfortunately, he lamented, the lack of lubrication often led to the truck coming in with a noisy, or as he put it, “exploded” throw-out bearing. That conversation made me wonder what lube points might be easy to miss on automated manual transmissions. Of course with this type of transmission, “automated” does not mean maintenance free. Using the Eaton UltraShift Plus automated transmission as an example, there are a few items related to clutch maintenance that make it much easier to keep track of greasing the clutch on a schedule and to perform the lube procedures. First, let’s take a look at the scheduling for greasing the clutch. Eaton makes an optional prognostics feature available that alerts the operator when the clutch throw-out bearing needs lubrication. This alert comes across briefly as “GI” on the gear display accompanied by a sound tone each time the engine is started. This alert continues on engine start-up until the clutch is serviced. It is also important to follow the reset procedure for the clutch prognostics which counts the clutch actuations. If the reset is not performed, the bearing could go beyond the recommended service interval and fail for lack of lubrication. Note that for vehicles not equipped with the prognostics feature, the clutch needs to be greased according to the published schedules. Second, the steps to grease the clutch on the Eaton UltraShift Plus are also much easier now than back in the day. Placed one-above-the other on the heavy-duty clutch housing are two grease fittings. Next to the top fitting is an identification marking of “CF” which indicates this fitting is for the cross-shaft. The second grease fitting, located just below, is identified with “RB” for release bearing. 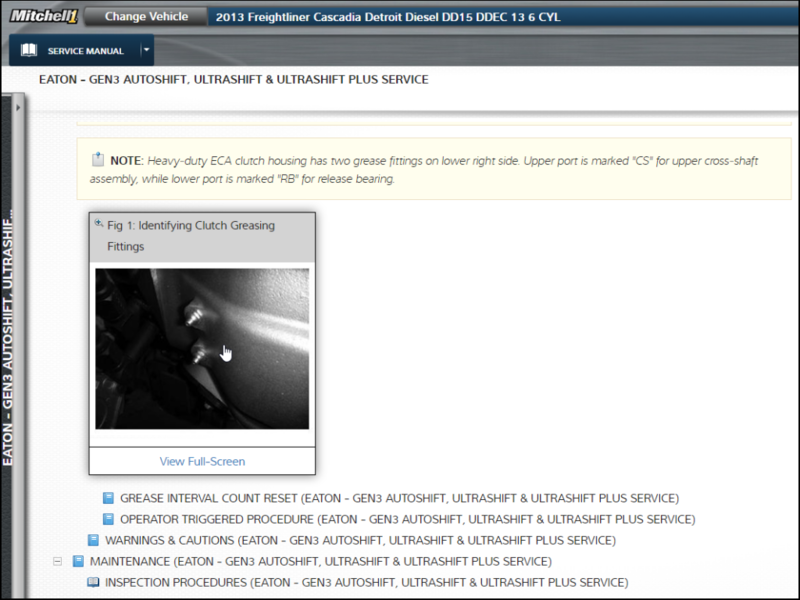 Refer to your service information — like that found in the TruckSeries truck repair software from Mitchell 1 — for the procedures and recommended lubricant to perform this service. Over the years trucks have obviously become more and more sophisticated. With this additional complexity also comes less effort needed to both operate and maintain the truck. However, these vehicles are still not maintenance free. But easier maintenance procedures do make it more likely that the vehicles will be properly maintained, and that will definitely make your life a bit easier, too. Jake Schell is the Associate Product Manager for Mitchell 1’s commercial vehicle product line. He has been with Mitchell 1 since 2001. Prior to coming to Mitchell 1, Jake spent 20 years as a technician, with Chevrolet Master certification in the transmission category as well as ASE certifications in both car and truck.